This online writing environment digitally archives the embodied rhetoric, issues and projects that relate to me as an Assistant Professor at Santa Clara University. 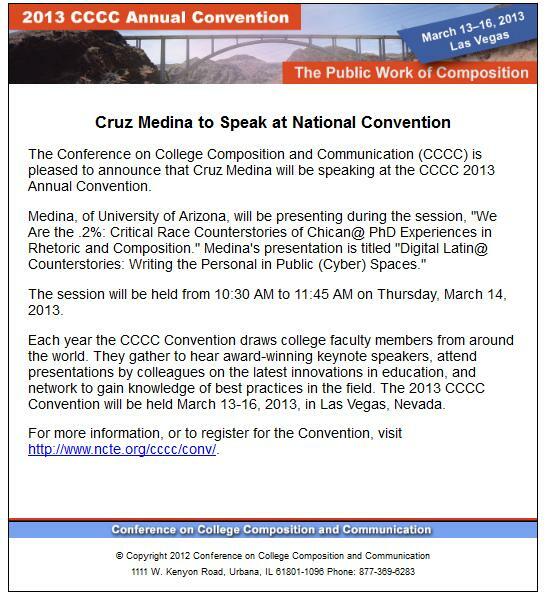 E-mail me at: cnmedina AT SCU DOT edu. 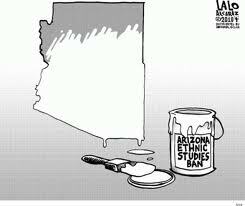 "An Arizona official who led the effort to suspend Mexican American studies from Tucson public schools is considering taking his fight to the state university system. Arizona’s superintendent of schools, John Huppenthal, says Tucson’s suspended Mexican American studies curricula teaches students to resent Anglos, and that the university program that educated the public school teachers is to blame. “I think that’s where this toxic thing starts from, the universities,” Arizona Superintendent of Schools John Huppenthal said in an interview with Fox News Latino. via Arizona Official Considers Targeting Mexican American Studies in University | Fox News Latino. Huppenthal is not satisfied with the suspension of the Tucson program. He views the University of Arizona as another source of what he believes are biased educators." I write and teach rhetoric and writing.